Another interesting talk last Friday! Hassan presented the work of his PhD seminar. Supervisor Dr. Tavoularis was also on hand to listen. Big Sam presented last Friday – a really interesting talk! Supervisor Dr. Bertrand Jodoin was on hand to listen to the talk. Click on the photos for a larger version. Sam Leblanc-Robert at his MASc thesis seminar talk. 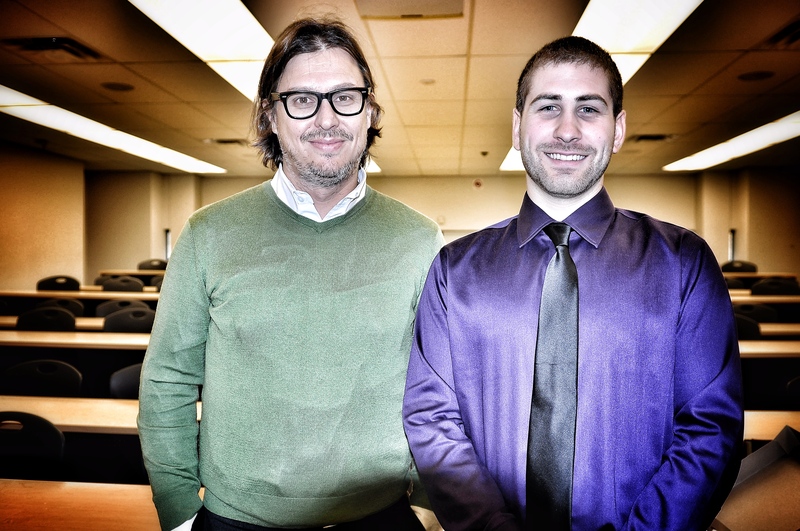 Sam Leblanc-Robert and supervisor Dr. Bertrand Jodoin after Sam’s MASc thesis seminar talk. 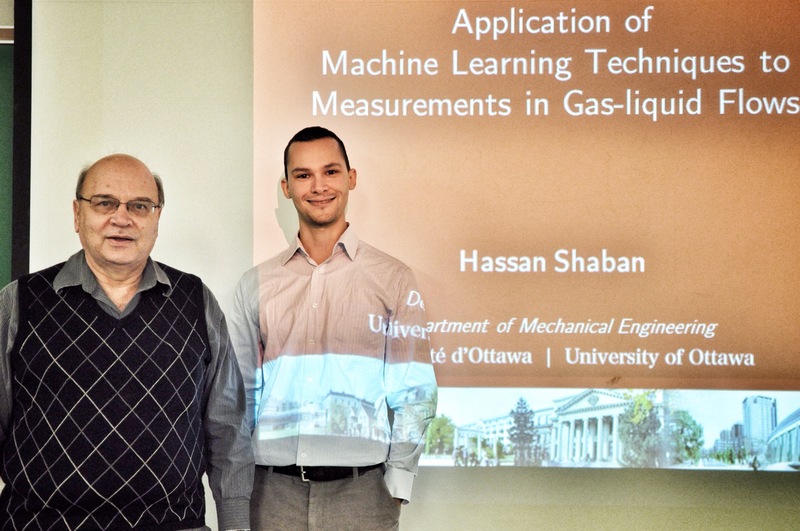 Hassan Shaban will present his PhD seminar talk this Friday on “Application of Machine Learning Techniques to Measurements in Gas-liquid Flows”. The abstract of the talk is below. Hassan is working on his PhD under the supervision of Dr. Stavros Tavoularis. Gas-liquid flows are found in the environment, as for example in clouds and breaking water waves, as well as in many industrial settings, as for example in heat exchangers containing boiling liquids and in petroleum pipelines in which oil flows mixed with gases. In this seminar, novel experimental methods will be presented for the identification of the flow regime and measurement of the flow rates of both phases in gas-liquid pipe flow using simple instrumentation. The differential pressure was measured in vertical upward air-water pipe flow, and the probability density function (PDF) of normalized differential pressure, was found to be indicative of the flow regime. The Elastic Maps algorithm was used to project this PDF onto a two-dimensional map, which when appropriately calibrated, allowed a user to identify the flow regime from the co-ordinates of the projected point. Also, the flow rates of the two phases in vertical upward air-water flow were found to have consistent effects on the PDF and power spectral density of normalized differential pressure. Artificial neural networks were used to correlate these features extracted from the differential pressure signal to the flow rates of both phases. Compared to other methods of flow regime identification and two-phase flow rate measurement, the developed methods had the advantages of being automated, non-intrusive and economical, such that their use was feasible in industrial as well as laboratory settings. To conclude the talk, other examples of the integration of machine learning with fluid flow instrumentation, as well as a practical application of similar methods in a header-feeder system will be briefly described. Samuel Leblanc Robert will present his MASc seminar talk this Friday on “Restoration of damaged aluminum parts on aircrafts”. The abstract of the talk is below. The aerospace industry is growing at a fast pace and aircrafts manufacturers consistently keep improving the performance and efficiency of their airplanes in order to reduce the operation cost. Aircrafts have become tremendously technological and a lot more emphasis has been accorded to details these days in order to get the edge over the competition. A field that is often forgotten is the restoration of damaged parts on airplanes. These gigantic flying mechanical devices are subjected to high structural and aerodynamic loads during their life. They are also exposed to rough environmental conditions that can enhance corrosion formation. These circumstances will eventually damage parts on aircrafts and results in high replacement costs. The aerospace industry has shown interest in several methods used to restore damaged aircraft parts. One of these methods is cold gas dynamic spray. The process consists of accelerating particles (ranging from 1 to 100 μm typically) to high velocities and produce coatings. The purpose of the coating is to protect a surface from wear, oxidation and corrosion. It can also be used to restore cracks and missing material on a component. This research project focuses on the feasibility of producing pure aluminum and aluminum 7075 coatings to meet industry standards. Christian Poupart presented his MASc seminar talk last Friday. Supervisor Dr. Matei Radulescu was on hand to listen to the talk. They were kind enough to let me take their photo. Christian Poupart with supervisor Dr. Matei Radulescu.